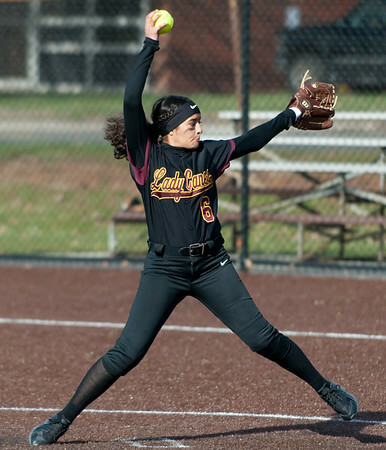 NEW BRITAIN - It was an important win for the New Britain softball team Friday afternoon. A day after learning the Hurricanes had lost all-conference player Gabby Roy for the rest of the season with a knee injury, they held off Conard for a 5-3 win. Jada Lawson provided one of the biggest hits of the day, hitting a two-out, bases-loaded triple in the second. The Hurricanes never looked back. Joseleen Rivera earned the win and hit an RBI double, while Valentina Hernandez also drove in a home and had three stolen bases. New Britain is now 10-6. Glastonbury 6, Newington 1: David Magsayo had to play up for the Indians and did more than hold his own. Usually the No. 4 singles player for Newington, the senior was pumped up to No. 3 and picked up the lone win for his team, beating the Tomahawks’ Matt Parker in a tiebreaker set 6-2, 4-6, 10-8. Southington 7, Windsor 0: The Blue Knights picked up another easy win for their 11th of the season. Abby Murphy, Coral Tommervik, Molly Murphy and Joelle Stublarec all picked up singles wins for Southington. Emma Wojcicki and Jill Watson were also victorious. Simsbury 5, Newington 2: The Indians claimed one singles and one doubles match. Abby Mollloy claimed the No. 3 singles match against Simsbury’s Pavayee Socrates 6-0; 6-3. Lindsey Weaver and Julia Mazur claimed the No. 2 doubles match against Allie Hoffman and Lily Johnston defeated them 5-7, 6-4 and 10-1. “The girls played hard against a very tough opponent today,” Newington head Sean Hussey said. New Britain 211, Bloomfield 268: It was quite the week for the Hurricanes. Playing an usually high amount of matches of the course of seven days, New Britain went 3-1. “I’m proud of the way the kids stepped up this week,” Hurricanes head coach Bob Zadrozny said. New Britain’s Johnny Morell was the medalist of the match with a 44 with Arthur Bell (48), Danny Bentiz (59) and Brandon Carlina (60) rounding out the scoring. Middletown 215, Plainville 255: Blue Devils head coach Mario Pires perhaps put it best, his young players are getting plenty of experience. Middletown’s Logan Frame was the medalist of the match after shooting a 44. Haylie Garrison was Plainville’s low scorer of the afternoon after shooting a 59. She was followed by Kaylee Markavich (59), Jessica Royce (68) and Alexia Sirois (69). Posted in New Britain Herald, New Britain, Newington, Plainville, Southington on Friday, 11 May 2018 21:58. Updated: Friday, 11 May 2018 22:01.